Designed as the sequel to the highly thought of Star Fleet, Star Fleet II was aimed at being bigger, better and more complex than its already complex predecessor. Both were war simulation games where you controlled ships and armies, in the first game with the aim of defending Earth from aliens and in Star Fleet II you played as the aliens, intent of conquering planets throughout the universe. However the making of the game was fraught with difficulty as the complexity of the game overawed the programmers, who struggled with the game until an eventual release in 1989 that was peppered with so many bugs and faults as to render the game almost unplayable. Although updated versions were released that solved many of the problems, according to designer Mark Baldwin, the brand name of Star Fleet was so damaged by this time as to make a port to other systems pointless. Another major problem at the time involved legal wrangling within the company making the game, Interstel, which was an affiliate label with Electronic Arts. The original designer of the Star Fleet games, Trevor Sorensen, was deposed as president of Interstel while on holiday in Europe, meaning he spent the next few years involved in legal battles with the board members who had taken over. 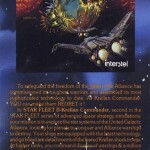 Despite winning the legal battles Interstel folded in 1992 and with it any chance of Star Fleet II being ported to other systems or another sequel being made for the PC. Nevertheless, a programmer called Brett Keeton, who Sorensen describes as the greatest programmer he ever worked with, was making a C64 port at one point. Despite his best efforts the game was simply too large for a feasible port to be made, with the entire memory of the C64 filled yet the surface barely scratched on the game. There was another person working on an Amiga port, which may have had the capacity to run the game, but problems within Interstel meant that this too was never finished. According to Sorensen, an Atari ST version was actually closer to completion at the time the ports were pulled than the Amiga version. 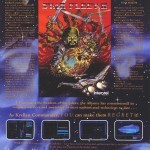 Tragically, Brett Keeton passed away in 2002 so there is no chance of ever seeing what the C64 version of Star Fleet II would have looked like. He also possessed the only copy of the source code for a deluxe version of Star Fleet he was working on with Trevor Sorensen and another programmer called Mark Hartman. We may be able to find out more from Sorensen’s notes, which he has said he will look for. Perhaps they are our last chance for more information on the unfinished games. The story of Star Fleet seems littered with tragedy and setbacks, but Sorensen is still hopeful of some day releasing a deluxe version of Star Fleet and the spin-off Star Legions. Judging from the high regard Star Fleet is still held in by gamers worldwide I think that support for this project would be considerable. You can read Mark Baldwin’s and Trevor Sorensen’s comments in the ‘Creator Speaks’ section. They explain what happened far better than I ever could. "Star Fleet 2 for the PC ended up being a disaster for a number of reasons. The biggest was the project was too big for our resources. We tried to do it as a 2-man project and we needed much more. The result was unplayable releases, for which we spent a lot of time patching. By then the game had such a bad name that it just was not viable to port it. One side note. My responsibilities for Star Fleet II was the planetary combat portion of the game. That portion got extracted and released as a separate game called Star Legions. This may have been one of the first RTS games ever published. What I'm doing these days mostly is teaching game design for University of Advancing Technology. I still consult to the industry some and occasionally write an article." "Concerning the C64 and Amiga versions of SFII: Brett Keeton, who did the C64 version of SF I (along with the Apple II and Apple GS versions) also did the C64 version of SF II. He was the most talented programmer I've ever known (he died in 2002) and he worked on SF II until he had completely filled the memory and had barely scratched the surface of what the game needed to do. SF II was just too big & complex for the C64. When he gave up we had navigation, universe creation, weapons, etc. working, but couldn't include all we had to. There was another person working on the Amiga version, but events at Interstel caused that version to never be finished. I was President & Chairman of Interstel Corporation from its inception in 1986 when we were picked up as an affiliated label of Electronic Arts. SFII for the PC was finally released in August 1989, and while I was on vacation in Europe there was a hostile takeover bid of the company by the General Manager and a Director (Board Member). When I returned from vacation I found out that I was no longer president (the General Manager had replaced me) and for the next several months a legal battle tore the company apart. I had to resign as chairman in early 1990 because of conflict of interest (I was trying to get royalties due to me) and although I was finally vindicated and we ousted the guy that took my place, by then the company was in deep financial trouble and there was still an unresolved legal battle occurring with the renegade director, so in 1991 I sold me shares of stock and exited. The company folded in 1992 with the IRS chasing the then-president for back taxes - he conveniently disappeared along with most of the assets of the company. Thus the reason that there was never any other version of SFII except for the PC. This explains also why there was never a SF III (I had designed outlines for games through SF VII). In 1990 I went back to the aerospace industry and got a job with Bendix Field Engineering (now Honeywell Corp.) in Alexandria VA where I produced a new updated version of SFII (Version 1.5) in 1991. It was never sold in stores - just provided as an update. SFII was only on the market for three months during which time it sold about 25,000 copies. I hope this has been helpful. I am hoping that there will be a SFII Deluxe or Star Legions Deluxe some day."